We maintain strict editorial integrity in our writing and assessments. This post contains links from our advertisers, and we may receive compensation when you click these links. Any opinions, or reviews expressed in this article are those of the author’s alone. Please visit our Advertiser Disclosure for more information and to view our partners. If you want decent rates from a widely acclaimed name in finance, you may want to look into American Express® Personal Savings. American Express® Personal Savings is a limited in its offerings, with only savings accounts and certificate of deposit accounts to choose from. There are also no physical locations to visit, so you have to make all your transactions online. However, if these factors don't factor into your savings goals, American Express® Personal Savings can give you savings rates that outperform even some of the biggest banks. Although American Express (Amex) is best known for credit cards, it also operates a personal savings division. Founded in 1850 in Buffalo, New York, the company has grown exponentially and is now headquartered in New York, New York. The publicly traded company (stock symbol: AXP) has $158.9 billion in total assets and total revenue of $32.1 billion and is the world’s largest card issuer by purchase volume. With over 56,000 employees and partnerships in 130 countries, American Express is a global company. The company began offering savings options in late 2008. American Express offers two products: online savings accounts and certificates of deposit. While it’s not the most robust product offering, American Express counters that with its above-average bank savings rates. American Express provides consumers with two options for savings: high yield savings accounts or CDs. It’s up to you whether you’d like to open one account or both. For those looking for easier access to stashed money, a savings account is a good option. For those who’d like to earn a little more interest on money they don’t need to touch for a while, CDs may be the better choice. Access to Your Savings Online, mobile, via phone or electronic transfer. Security FDIC insurance up to the maximum amount allowed by law ($250,000). One of the easiest ways to put money aside is with a savings account. It’s safer than stockpiling cash under your bed or in your purse, and can help you build toward a future purchase or expense. And with the digital age allowing banks to operate online, it couldn’t be simpler to start open a savings account. Gone are the days where you’d have to drive or walk to a bank to deposit a check or cash. Now, you can do many of those functions remotely, either by phone, online or by mail. The benefit of a savings account is that it’s generally a secure place to keep liquid assets. You won’t get amazing interest rates with a savings account because it’s not considered an investment account. You trade easy access to funds for lower interest rates. With an American Express High Yield Savings Account, you’ll have Federal Deposit Insurance Corporation (FDIC)-insured backing for up to $250,000 in funds. Interest rates are advertised as above average, and Amex makes it easy to link to your current bank account. Since American Express doesn’t offer a retail banking suite of options, such as checking accounts, retirement accounts or loans, the company compensates by making it easy to open and use its two savings products. If you opt to open an account, you can deposit any amount of money. There’s no minimum amount to open, and you won’t be charged any fees to maintain the account. You’ll need your current bank account number and routing number to begin. You can make deposits online or by mailing a check. 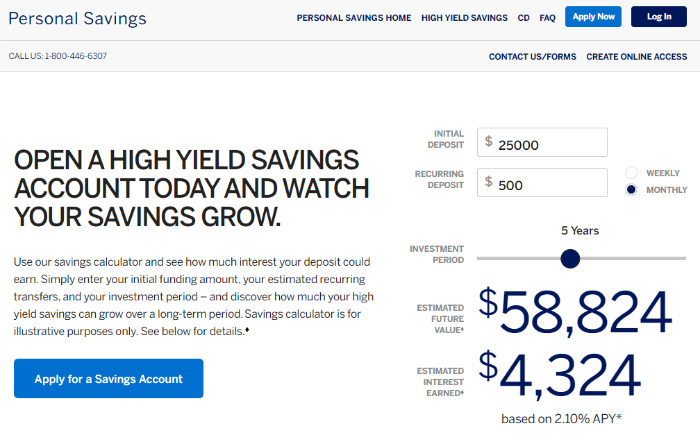 Even before you open an account, you can play with Amex's tool on the High Yield Savings Account page, shown above, to estimate your earnings according to your initial and recurring deposits. By Federal Reserve savings account regulations, you’re allowed six transactions per statement cycle. Transactions include withdrawals and transfers. You’re allowed an unlimited number of deposits. When you transfer funds to your American Express account, you’ll see the current balance immediately reflected, but the funds won’t appear in available balance until the fifth business day after the deposit is initiated. This is due to a policy of due diligence. If you’re pushing money to an external bank account, the funds will usually be reflected at your bank in one to three business days. It will depend on your bank for how quickly funds will be available for use. Minimum Deposit No minimum deposit; shortest term is six months. Access to Your CD Online, mobile or phone access. If you’re unfamiliar with what a certificate of deposit (CD) is, it’s another savings option. The simplest explanation is that it’s a deposit that locks your money up for a certain amount of time. Once you reach that time limit, your CD has reached its maturity date. That means you can withdraw the money, penalty free, or roll the money into another CD. While a CD will lock your money up for the term length you’ve selected, you’re guaranteed the interest rate you signed up for as well as getting your money back. Unlike many banks, American Express doesn’t have a required minimum deposit to open a CD. Technically, you could open one for $1. However, that’s not the best way to benefit from the bank's high interest rates. When it comes to rates, generally the longer the term, the higher the interest rate. American Express offers seven different term rate options ranging from six months to five years. While it’s a decent range of offerings, other banks do offer 10 or more term rates, sometimes as short as three months or as long as six years. When you visit the American Express CD page, shown above, you can play with their tool to see your potential earnings depending on your deposit and the term length. If you’re wondering what the best strategy is for maximizing CDs, you can look into CD ladders. This savings method includes buying several different length CDs so that your money is broken into smaller chunks and different term lengths. Your funds become available for withdrawal at staggered intervals with a CD ladder. An example would be picking three different options, let’s say six months, 18 months, and 24 months with $1,000 each, rather than choosing one CD at 24 months for $3,000. You can split it up in a number of ways. It depends on how much cash you’d like available at what time. When you open a CD, American Express Bank has to receive your deposit within 30 days of application approval. With CDs, you can’t add funds as with a savings account. Once you have a term length and deposit amount, it’s set. You can always open another CD, but you can’t add funds to an existing account. In any case, your money is still FDIC-insured, which means that even if the bank fails, you’ll receive your funds. Where Can I Find American Express Bank? You’ll only find American Express online, not at any physical locations. You can communicate over the phone with the company 24 hours a day seven days a week if you don’t have internet access. Phone support includes customer service for existing account holders as well as support for those trying to open an account. The website is accessible at any time as well. What Can You Do Online With American Express® Personal Savings? American Express® Personal Savings operates online. Information is easy to find on its website and you’re able to learn about your different options for CD terms on the site as well as for personal savings accounts. 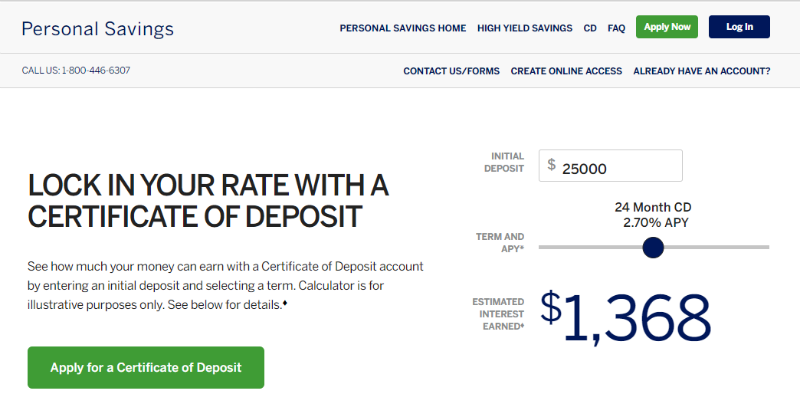 Each savings product has a landing page that will show you the steps to opening an account and the current interest rates. The frequently asked questions section is fairly detailed which is helpful for customers trying to avoid a lengthy phone call. As for access, you can login to your account on a desktop or on your mobile device. There isn’t an app to use, but the mobile version of the site is optimized. You can apply for a savings account or a CD entirely online without having to speak to a representative. To fund the account, you can link an external bank account online using your account and routing numbers. This process will take two to four business days to complete and involves confirming small deposit accounts. You’re able to monitor your accounts online as well as transfer funds or set up recurring transfers. If you want to add or modify beneficiaries to your account, you can do so online as well. You won’t be able to integrate your account with Quicken or Mint, as American Express does not wish to share customer personal information. As an alternative, you can download transactions and import them yourself to Quicken. Additionally, you will have to call or write to dispute a transaction, you won’t be able to complete that action online. Lastly, you can close your account online as well by transferring all of your funds from the account and choosing the ‘Close Account’ balance button. You can monitor your money online or over the phone at any time. When you need to withdraw or deposit money, you can do so online or via the phone. A slower alternative is through mail where you can deposit checks by sending to American Express’ listed address. One of the first things you’ll want to do for easy access is to link an external bank account. For that, you’ll need your account and routing number. After you provide that information, it may take two to four days for the accounts to be linked. You’ll go through a verification process where amounts smaller than a dollar are deposited for you to confirm the account. Once your account is linked, you can transfer or deposit funds from or into your savings account. It will take roughly one to three business days for funds to be reflected in your account. To access the interest you earn on a CD, you can call and request that earned interest is sent to a linked account, an American Express high yield savings account or as a mailed check. You can change options at any time, as well. If you start off letting the interest accrue in the CD account and later decide that you want it sent to your bank account, that’s completely your choice. If you must withdraw principal funds from your CD before it reaches maturity, you’ll have to pay a penalty. You also can’t withdraw only some of the money; American Express Bank requires you to withdraw the entire CD, which will close the account. This is yet another reason why you should be sure of how much you want to lock up in a CD prior to setting up an account. How Can I Save More Money With an American Express® Personal Savings Account? You may not earn staggering amounts of interest with a savings account, but any interest is usually better than none at all. And if you’re keeping cash on hand rather than in the bank, you’re losing out. The same goes for checking accounts. If you’re keeping all your money in a checking account, you’re not accruing any interest. It pays to take a look at your finances and see where you could save money and build a nest egg even if it’s small. As the saying goes, “compound interest is the eighth wonder of the world,” and you could stand to earn some with a CD or savings account. Let’s look at an example of a woman who’s keeping an extra $3,000 in a checking account on top of the normal funds in there for rent, bills and groceries. Let’s say the money is for a motorcycle she plans to buy in the next few years. At the moment, the money’s just sitting in a checking account. If she puts her money into a savings account at 2.00% APY, after three years she’ll have $3,184. With a 36-month CD at 2.75% APY, she could earn $254 interest. While interest earnings of $184 or $254 may not seem huge, it’s passive money accrual that’ll happen simply by keeping money in an interest accruing account. Of course, you stand to earn more with longer terms and larger amounts of money, but any savings can be useful to start. One thing to remember however, is that savings accounts don’t guarantee interest the way CDs do. While you’ll lock in the interest rate for a CD, a savings account can change interest throughout the year which may mean less (or more) savings. What’s the Process for Opening an Account With American Express Bank? 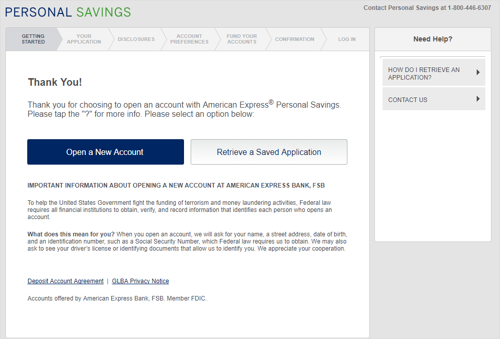 If you’re ready to open an account, you can follow the steps listed on American Express® Personal Savings website. The first page of the application process is shown here. You're given the option of opening a new account or retrieving a previously saved application. Then you’ll need to gather your information, which includes your Social Security number, email and home address, phone number, date of birth and account and routing numbers of an external bank account. You can call at any time to apply for an account, or complete the process yourself online. After you apply, you’ll receive email or online confirmation (or both) when your application is approved. American Express also sends a welcome kit through the mail after approval. The next step after your account application is approved is the initial deposit. American Express Bank needs to receive your high yield savings deposit within 60 days of approval. With CDs, you have 30 days. You can choose to mail a check, or you can link an external bank online and transfer funds digitally. American Express has no minimum opening deposits, which means you could open an account with 1 cent. You also won’t be charged any fees for having the account open. If you applied online, you’ll have a personal savings account that you can log into at any time. You’ll be able to track your savings and interest as well as manage and transfers or withdrawals from your online account. First of all, you should compare interest rates before committing to a bank. You may find higher rates at another similar online banking company, which could earn you more over the long run. This is especially true for CDs. While savings account interest rates will fluctuate, you’re locked in with a CD, so you’ll want to find the best rate for the term you pick across multiple companies. While American Express advertises higher interest rates than traditional brick-and-mortar banks, you may find better rates at another online savings bank. Additionally, American Express doesn’t advertise a CD 10- or 15-day “rate guarantee,” like other companies do. This means your CD interest rate may change up to the moment deposit funds are received. Other banks will give you the higher interest rate in the case the interest rate drops from application to your initial deposit. You’ll also need to decide whether mobile deposits and ATM cards matter to you. American Express doesn’t offer either service. This could possibly only be an issue if you foresee wanting to access your money through other means rather than the online site. And if you’re planning on transferring money on a one-time or recurring basis from an existing external bank account, it may not matter to you that American Express requires check deposits via mail. If your primary bank offers mobile deposits, you may not care if your separate savings account does too. But it all depends on how you plan on using the account. If you can find a bank that offers both, such as Synchrony, you may not have a reason to use American Express. Finally, American Express only offers two savings products and offers no in-person banking. If you wanted IRA accounts or money market accounts, you won’t find them at this company. And if you like visiting your bank in person, you won’t get that with American Express. American Express may not hold up to other choices such as Synchrony Bank which offers more customer friendly services such as mobile deposits and ATM cards. American Express operates solely online, yet lacks on-the-go friendliness, with requirements to mail in checks for deposit. While it does boast no CD minimum deposit, which is relatively rare, its rates aren’t the highest in the industry. You can get the same online services and products at companies such as Goldman Sachs, which offer higher interest rates. And if you’d prefer more options for transferring and depositing funds, there are better companies to choose from.